Search for all "KDEL Receptor 3 / KDELR3"
Rabbit anti Human, Mouse KDEL Receptor 3 / KDELR3. 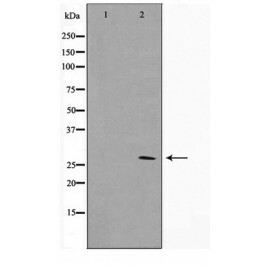 The immunogen for anti-ERD23 Antibody: A synthesized peptide derived from human ERD23. KDELR3 Required for the retention of lumil endoplasmic reticulum proteins. Determines the specificity of the lumil ER protein retention system. Also required for normal vesicular traffic through the Golgi. This receptor recognizes K-D-E-L. Belongs to the ERD2 family. 2 isoforms of the human protein are produced by altertive splicing. Note: This description may include information from UniProtKB. 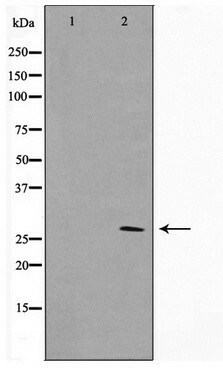 Rabbit IgG in phosphate buffered saline , pH 7.4, 150mM NaCl, 0.02% sodium azide and 50% glycerol. Store at -20?. Stable for 12 months from date of receipt.